The new PHANTOM  C410 is the only high performance 360° radar and laser detector combined with a front 180° top quality radar and laser scrambler in one sleek package. 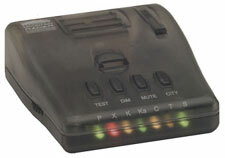 The detector compared favorably with the best detectors in the market. The scrambler makes your car invisible to both radar and laser and works so well it is backed by one-year manufacturer ticket rebate guarantee. You get a ticket, The manufacturer will pay it. Forward 180° Radar and Laser Scrambler.